He came in with a bang but went out - literally - with a whisper. Jack Arnstrong roared into Toronto's CHUM in June 1968, the loudest and fastest-talking jock the city had ever witnessed. But the man born John Larsh soon became disenchanted with the station's soon-to-arrive Drake-style format modelled on the successful Bill Drake-consulted format in the U.S. By February 1969, he'd had enough and decided to "work to rule", that is do the format with absolutely no energy, let the songs play out entirely, dead air between the jingles and the start of the record, those kind of shenanigans. 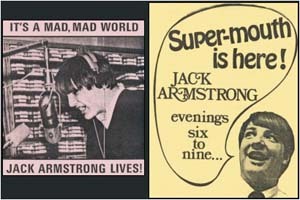 Three hours into his show, Armstrong was fired and swing jock Hal Weaver came in for the last hour. So ended the Jack Armstrong era at CHUM. He moved to WPOP Hartford later in 1969, went to KTLK Denver for a few months then returned to the CHUM listening area at Buffalo's WKBW in the fall of 1970. Enjoy Jack Armstrong on CHUM here.